There and Back Again: An Elf's Endeavour: CC: Past the Point of No Return? Last week on my way to the set of Degrassi, I figured I might as well pick up a book to read since I'd probably have lots of down time. So I headed up to Elliot's Bookstore, just north of Wellesley, to pick up a copy of The Hobbit, which I am ashamed to say I haven't read in years. When we got to the Tolkien section though, there wasn't a copy in sight. 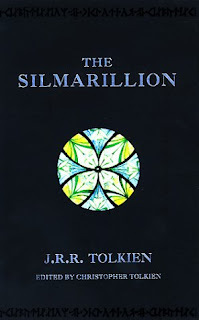 There was something else though that did catch my eye: a copy of The Simarillion, Tolkien's legendarily boring book about ancient middle earth containing all of the stories and legends that are referred to in Lord of the Rings and The Hobbit. Apparently it's almost exclusively about elves and chronicles their long history. The sort of thing only a die hard Tolkien nerd would ever read, and has been hailed by The New York Review as "an empty and pompous bore". But really how bad could it be? All the bad press has to be exaggerated. Right? From the minute I saw it, I knew that I had to read it, no matter how painful it may be. How could I claim to be the perfect person to play an elf if I hadn't learned all of their long back story. The man at the counter confirmed my suspicions that I was entering seriously nerdy waters. "It's like reading stereo instructions," he told me when he saw what I was buying. "It gets better once you get into it though. The language stuff is pretty cool, but everything else is really dorky." Hmmm... dorkier than a make believe fully grammatically functional language created for fictional characters in a fantasy book. I was baffled. We told him about our plan to be elves to explain the purchase. "Did you lose a bet or something?" he replied. "You're seriously starting to enter 'dying a virgin territory'". This is coming from a man who's working in a used book store and has read The Simarillion on his own accord for fun of it. I'm starting to wonder what I've gotten myself into. On set I managed to read the first twenty pages, a creation story of middle earth that reads like the book of Genesis. I'm about to give it another go right now, since my computer is being fixed and I can't work on Adventurer tonight. Wish me luck.